Portuguese mariner, honoured with being the first circumnavigator of the globe as a result of his leadership of the Spanish-funded circumnavigation of 1519-22 which comprised 5 ships & 270 men. It is slightly inaccuarate honour to give to Magellan, as he was in fact killed on the Philippine island of Mactan in April 1521 and the final part of the expedition from Asia to Europe was completed under the leadership of Sebastiano del Cano. Magellan's flagship Victoria arrived back in Spain in September 1522 with only 18 remaining survivors. Magellan discovered the Pacific Ocean, via a route through the dangerous Straits at the southern tip of South America, which now bear his name. 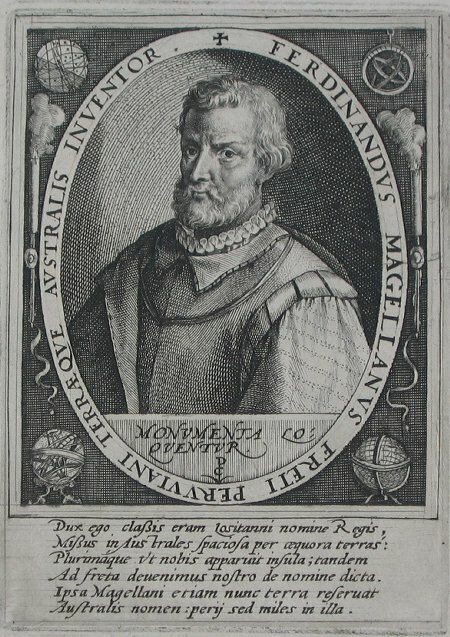 Much of what is known of Magellan's expedition comes from the account of one of the few survivors, the Italian Antonio Pigafetta.